Aim and Objective: In this study, for the first time keplerate cluster [Cu20Cl(OH)24(H2O)12 (P8W48O184)]25- (hereafter [W48P8Cu20]) was supported on SMNP (Fe3O4-@SiO2) via amine functionality (ASMNP) as a magnetically-recoverable catalyst (hereafter [WPCu@ASMNP]). This nanocatalyst showed high activity for the synthesis of cyclic carbonates under solvent-free conditions. Materials and Methods: After preparation, the nanocatalyst was characterized by FT-IR, XRD, ICP-AES, TGA, TEM and SEM. Surface acidity was determined by a potentiometric titration with n-butyl amine. The effect of different parameters like catalyst amount, reaction time, temperature and pressure in the presence of [WPCu@ASMNP] were studied. Results: Optimal reaction conditions were obtained for 0.5mol% of catalyst, reaction temperature of 100°C and CO2 pressure of 1.5 MPa. The [WPCu@ASMNP] could be separated from the reaction and reused for five times with an external magnet without notable decrease in the activity. Finally, stability of the catalyst and its reusability were evaluated using a hot filtration method. The FT-IR and the control experiments (hot filtration) after five cycles confirmed the strongly catalyst immobilization to the ASMNP. 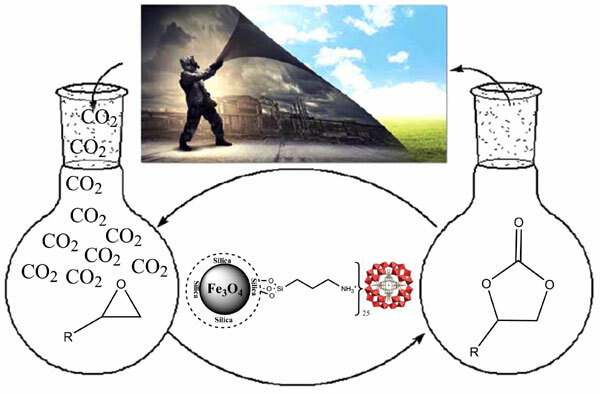 Conclusion: The nanocatalyst is shown to be effective heterogeneous and recyclable catalyst for the synthesis of cyclic carbonates from CO2 and epoxides under mild conditions without any additional co-solvent and cocatalyst. This catalyst has a good substrate tolerance as demonstrated by its activity towards different epoxides. Importantly, the reaction could be carried out under solvent free conditions. The heterogeneous nature of the catalyst is proved by recovering and reusing this catalyst without any appreciable loss in catalytic activity and by the FT-IR spectroscopic characterization of the fresh and spent catalyst. The product separation and catalyst recycling are short using an external magnet. Coupling reaction, green chemistry, CO2, magnetic nano-particles, cyclic carbonate, keplerate polyoxometalates.